Turkey Broadhead choice and why? Re: Turkey Broadhead choice and why? 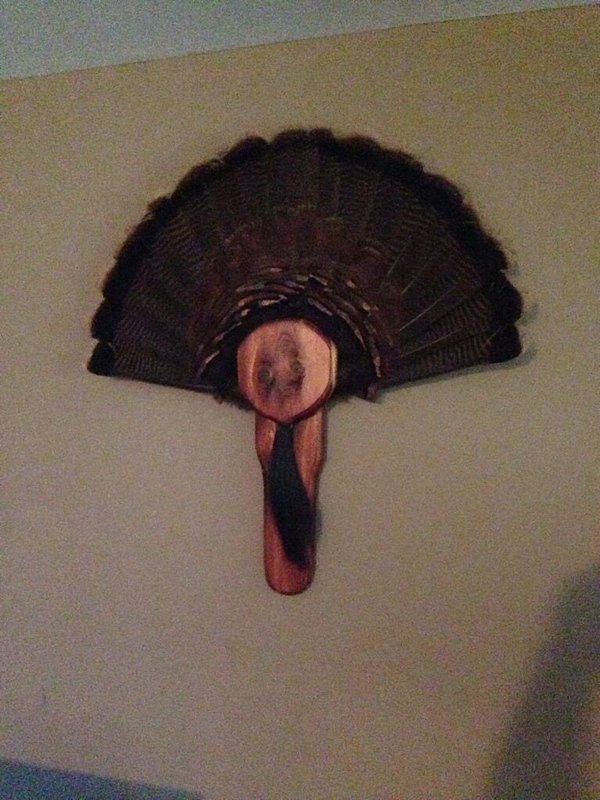 Tree shark is my favorite broadhead for turkeys. I made a broadside hit on a big tom 3 years ago from 15 yards. Shooting 50# recurve but using 3 blade heads. I completely knocked him off his feet, before he jumped up and ran away. Looking at the head it showed a bit of blood with only about 1/2" penetration. No idea what bone I hit in his wing, but convinced me to stick with a good two blade from then on, usually Ace. "May your blood trails be short and your drags all down hill." Have harvested gobs with Magnus Stinger, Snuffers, Zwickey Eskimo, Woodsman, Big 3’s, 3 blade VPA and Tree Sharks. If the bird design was such that they would absorb the full impact instead of being knocked off their feet, then a large snuffer and a Big 3 would personally be great selections. Quickened immobility and personal confidence are paramount. Tree Sharks are easily my number one choice. Year after year I select the Tree Shark...tunes well...excellent penetration...devastating wound channel...short recoveries...easy to sharpen...reliable...shoots excellent thru netting...Turkey guild has lobbied hard to ban them. Where can I sign up for that turkey guild newsletter. Maybe able to get the inside scoop and learn something. I use the same broad head on everything - - - Zwicky delta 2 blade. However, would like to relate a story. First turkey I ever shot was with a 85# palmer long bow. Was using a 3 blade cut on contact broad head that had convex blades (opposite of concave). Broke wing bone, arrow deflected over turkey's back, only scratching it. Broad head never entered body cavity. If the turkey had run straight away, I never would have caught him. But he ran in circles with me trying to snag him with my bow. (Would have made a great video). I blame the convex blade for the ricochet off the wing bone. Only shoot straight edge blades any more. Tree sharks for me as well. It would seem obvious that everyone is ready to get back in the field for turkey. I will most likely be shooting a Zwickey Delta 4 blade, or maybe a Delta 2 blade. I will be launching them from a older 58" Martin Mamba, 55# that I just picked up last month. This I do know, this Mamba can surely launch a arrow with some authority! Can not wait to see how she does in the Turkey blind. Thats a funny story Rkelly. I am picturing the Rocky movie where he's trying to catch the chicken. Too Young to Be This Damn Old! I continue to use a Bear Razorhead with a bleeder blade. I grind off the very tip and then sharpen the new flat front tip. I've lost a few pounds over the years chasing and tracking toms. The older I get, the more I enjoy 'the chase'. NOT! I Become the Tree until I Become the Arrow. Practice - Practice - Practice - Beer. Works for me . . . I have killed a lot of birds with the Zwikee Eskimo 2 blade. This year I am going to use the Rock Mountain Cut Throat single bevel. I used them in Africa last August and they were great heads. So, why not continue using them on turkeys. Most any good sharp head will work IF you put it where it belongs. In the same thought - you can shoot the best head and loose the bird on a poor shot. Tree Sharks or Snuffers, like someone else said I have a bunch of Snuffers I don’t use for anything else so I may pick them but I love the Tree Shark as an all around head. I want to thank everyone for commenting. I am hoping everyone has a great Spring gobbler season and post some pictures! I'm sure glade to hear and see so many are going after turkey with trad gear. Beautiful mount Dennis,,,about your broadheads, why change something that works?? This is why I stick to Zwickey Deltas. Thanks John. Love huntin' me some Eastern Turkeys and there lots of 'em around West Michigan. As a Michigan Man I've always been a Fred Bear fan. Spent a few hours touring his museum in Grayling over the years. I started using the Bear Razorheads when I first started bow hunting with my Martin Warthog. I've tried a few other broadheads over the years, but the Razorheads just look so right to me on the end of my cedar shafts. I've used Zwickeys now and again and have nothing but good things to say 'bout em. If it ain't broke, don't fix it . . .
Stone heads that I make and because I can kill with them. The “V” filed back into the tip eliminates deflection we are 100% recovery Turkey hit with this head. The last Tom I shot at was with a tree shark. Aimed for the upper spine on a facing away shot. Hit right where I was looking, and was amazed to see my arrow skip off his back and fly up and away behind a puff of feathers. No blood, no penetration (string tracker) and was able to watch the bird run full tilt for half a mile or more across fields. I had assumed this was a freak occurrence. Maybe not? Might try this mod. Glad I remembered this thread, I was wondering what broadhead to use with my Javaman Elkheart. Quite a few are using bear razor heads, after a little looking I found my dads, that I had tucked away. Got them sharpened up and ready to go. Too many bows to list, and so many more I want to try! Keep the wind in your face, and your broadheads sharp.